I know I've been talking about the Panasonic G1 a lot lately, but I do find it a fascinating thing. 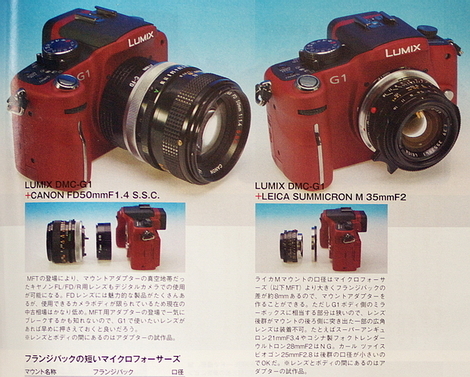 Anyway, I think a lot of people are going to find themselves fascinated by this: it's a page from the November, 2008 issue of the Japanese camera magazine Nippon Camera showing adapters that let you use Leica M lenses (right—and, on the left, Canon FD) on the G1. You can get them from CameraQuest, where they'll be arriving in late December. Cost, $175. Sure looks like potential gearhead fun! Featured Comment by Roger Suppona: "My G1 arrived last Saturday and my 4/3, Nikon, and M42 adapters arrived yesterday. Already I am liking the G1 a lot. I need to spend some more time with it but my Nikon days may be drawing to a close. "To use other lenses you have to change a setting on the G1 to tell it that it's OK to work without a lens attached before it'll do anything. After that it works like a charm. The display remains bright and viewable at small apertures and it's easy to focus. While playing with various lenses last night I thought it would be pretty cool to be able to use M-mount glass. Now it looks like I've something else to buy for the G1." That color red is just so wrong. Is the EVF really good enough for manual focusing of a Leica M lens? If so this is a fantastic development. Readers might also be interested in looking at some of the photographs posted on flickr by a photographer with the handle of Arri. His recent postings show photographs taken with the G1 and old cine lenses including the Schneider Cinegon, Taylor & Hobson Ivotal, and Schneider Xenon 0.95 25mm lens. I think the EVF is good enough for manual focus but bear in mind I've not had a chance to take it out for a real test drive--gotta get home before the sun goes down. Also, I went to the CameraQuest site. I think I'll wait until that adapter shows up elsewhere. He's charging $175 for adapters that sell for $30 or less elsewhere. I got my Nikon and M42 adapters from fotodiox (via Mike's Amazon link). I suspect that they're the same. BTW, you've got to use the Panasonic 4/3 adapter to use the other lens adapters. Looks like that's not the case with the M-mount adapter. Check out this thread of a G1 that sports a 50mm Canon f/0.95...there are also shots taken with a 15mm Voigtlander Heliar and other M mount lenses. They are even better. Not because the EVF is so great but because you see a magnified crop directly from the sensor. What is the best way to manual focus on today's DSLRs? Live view. The EVF shows Live View in the eye level viewfinder. I happily use the Nikon F-mount versions of the Voigtlander 12mm/f5.6 and 15mm/f4.5 lenses with my DMC-L1 as well as the Contax 45mm/f2.8 Tessar (see a photo of the combo at http://members.cox.net/jeffreygoggin/Contax-45mm-Tessar---DMC-L1.jpg ) and believe these will work equally well on the G1. For the time being, though, I'm holding off on buying a G1 as I just can't get past that clunky pseudo-DSLR form factor and am hopeful that Olympus comes up with something more appealing with its first m4/3 camera. Yes. Set G1 to MF and as soon as you touch the focus ring either the EVF or the LCD suddenly magnifies by...by a lot. Precise focussing is then possible. I say this only having used the supplied 14-45 Panasonic lens which seems tack-sharp to me. Oh, yeah! I was hoping this would happen. Now only for two things: that Olympus manufactures their camera with a viewfinder and for the Chinese to hop in on the adapter manufacture. If you take a look at Cirrus Adapter shop on ebay, you'll see that they have everything-and-anything to 4/3. From Pentax 6x7 and Hasselblad to the more ordinary Nikon, Contax and M42 adapters. It certainly won't be a problem for them to create a Leica M adapter for m4/3. Roger, I suspect that the Nikon and M42 adapters from Fotodiox you're talking about are adapters for the original 4/3. So yes, you would need the Panasonic 4/3 -> m4/3 adapter. It is not exactly Leica M style photography but interesting that it is now possible for Leica M lenses to be used on an SLR with no mirror. What is the factor to multiply the focal length of the M lens by when it is coupled with the micro 4/3 sensor of the G1? If Olympus or Leica has the vision, one of them should produce a simple rangefinder style m4/3 camera. Make it look like an M, for crying out loud. And if they are truly innovative, then produce an adapter with a reducing glass element to eliminate the crop factor. People would complain about why putting a $6000 Noctilux on a $800 body, but they would own the Leica users' souls. It's different enough from the M8 that they can justify existence of both. I was pleasantly surprised to find that the G1 corrects lateral chromatic aberration automatically for camera JPEGs, even with manual lenses. Panasonic doesn't advertise the feature for some reason. "an SLR with no mirror"
There is no such thing, of course. The mirror is part of the definition of what SLR means. The G1 is not an SLR. I suppose you'd call it a "large sensor interchangeable-lens EVF camera." "What is the factor to multiply the focal length of the M lens by when it is coupled with the micro 4/3 sensor of the G1?" Same as on any other 4/3 sensor camera, 2X. I won't be buying a G1 on principle. (Ooh, cryptic). OK, here's why: I live in Japan. Panasonic has decided that Panasonic cameras sold in Japan will only have Japanese menus. That's OK, I speak and read/write the language. But I'd rather have my menus in English because it's just much more at-a-glance efficient. You can buy an "overseas model," but it only comes in black, it only comes as a lens kit, and it's the equivalent of about US$85.00 more expensive. The on-the-street theory is that Panasonic has decided to do this as a grey market countermeasure, but there are a large number of native English speakers residing in Japan that would benefit from English menus. So I emailed Panasonic, described my case, and asked for an explanation. The answer I received was that there are two main reasons: 1) "we have to consider the priority of our customer's needs," and 2) "to reduce production costs." Both of these reasons are BS. #1 is just fluff, and #2 makes no sense because the export model has multiple switchable language menus. They have simply turned that capability off in the domestic model. So, although I am mightily impressed with the performance of this little camera and the incredible opportunities for indulgent geekery it provides, I won't buy one from a company that can't either a) tell the truth, or b) make up a decent excuse. The G1 may end up being the Leica CL digital replacement that I've dreamed about. I'm drooling over the CV 12 and 15mm lenses on this camera. BTW, Leica would never have a cheap body for M mount lenses. The last time they did that with the CL the sales of M bodies plummeted. They'll sell lenses for the G! with an adapter (some anyway), and they will spruce up the M8 so that it stays ahead of any pretenders. Further thoughts. I'm not sure the magnified manual focusing will work with other lenses as there is no electronic connection with the alternate lens and the camera. So you would have to use the viewfinder in its unmagnified state. Still workable, but not so nice. Also, with the right adapters my Zeiss 100mm Macro and Sigma 150mm Macro will now not only be killer macro lenses but serious telephoto lenses! Woohoo! Using an M lens on a G1 may be interesting if you're looking for longer focal length. With a x2 correction applied due to the sensor size, a 21mm already 'becomes' a 42mm. Right you are. It's not really very practical. Magnified manual focus works with legacy (non-4/3) lenses also, but you have to press a button to get the magnified view. I was excited to see the photograph of the Panasonic G1 with Canon FD Lenses. I have a closet full of Canon FD lenses (with A1, F1, FTB bodies) that I thought were all useless. If they can be used on the G1, I will be ecstatic. As I can't read Japanese, does anyone have any knowledge about this G1 / Canon FD lense adapter, and do you know how it will work? I also have some Mamiya 645 cameras with a wide range of lenses. Does anyone know if there are any digital cameras that could utilize these lenses? "Using an M lens on a G1 may be interesting if you're looking for longer focal length. With a x2 correction applied due to the sensor size, a 21mm already 'becomes' a 42mm." Few people would buy M lenses for the G1, but a lot of people, including me, who already have M lenses might buy the G1, or the upcoming micro 4/3 Olympus. You can get M-mount lenses down to 12mm (which would give you a nice 24mm FOV) and I have the Leica wide-angle tri-elmar in my own collection, which, at 16-18-and 21mm, would give me a great 32-36-42 walk-around capability. The real problem here is whether the sensor is good enough, and from looking at some of the G1 tests, I don't think it is -- that is, I don't think it's good enough on the Panasonic to really make Leicaphiles happy. The Olympus may be a different matter, and if it is really a good-quality sensor, then I'd be willing to bet that many (most?) Leica people would buy one. In fact, I think it would be a smart thing for Olympus to optimize the M-lens capability for its upcoming camera. Its own lenses will be enough cheaper (and good enough) that the M availability probably wouldn't cannibalize sales for people making an initial purchase of the system, but it would encourage a lot of sales to people who already have M lenses. I don't know much about the sensor details of micro-4/3, but I certainly hope all the sensors aren't identical; I really do see some problems with the G1 sensor. It seems to be slightly crappier than it should be. "So all that is needed is a tilt-shift adaptor for 35mm SLR lenses and with all space to play with it should not be too difficult to build one"
Actually, with a 15mm and a 2x crop factor, that would make a 30mm(e) with the depth of field of a 15mm. Am I the only one who still uses scale focus and hyperfocal focusing? G1 and G2 are combinations that excite many of us who are Contax G system owners. If only our Zeiss Contax G lenses could be adapted. Alas, they use a motor-in-body AF drive and have no manual focus ring at all. Any adapter makers have any bright ideas? I also remember when I bought my Contax G system about 9 years ago thinking how great it would be if the removable back could be replaced with a digital sensor back where the film pressure plate is. Put the electronics and power source in a screw-on base and grip. Everything else is already there. Sigh. I also remember thinking that if this expensive system didn't work out for me, I could always sell it and at least get my purchase price back, if not more. I didn't foresee the crash in film camera resale values. Uh huh. Panasonic hit a home run with this camera. I bought this camera with the intention of using it as a backup for both my E3 and M8, but now the G1 is my primary go-to camera. Like a breath of fresh air carrying this little featherweight around and the EVF and LCD are very clear and allow precise focusing. Kit lens is razor sharp and produces just superb images. Really looking forward to using the G1 with my M mount lenses. What would be a cool idea is if the camera maker introduced a 'manual focus helper' feature to use the autofocus logic with a manual focus lens. Show a focus spot, and once the area in that focus spot is in focus, display a 'Focus OK' message on the screen or in the viewfinder. All this is making me sorely tempted by the G1, but I'm sitting on my hands and waiting to see what Olympus launch next year. The real problem then is not so much the focal lengths of the lenses, but rather the f-stops. I for one am not very enthusiastic about a 24 f:5.6 EFL lens on an FT sensor, which would give us the apparent DOF of a 24mm f:8. Wouldn't need to worry about focusing though, but still. But the high-ISO performance of these are not up to the task. That upcoming 20mm F1.7 (40mm EFL) does however sound very nice. Maybe even tempting enough to tip me over to the Olympus side again. But not with to the Panasonic side. The G1 is HIDEOUS. What are you people thinking? Sold! But only if it has room inside for an old 35/2.8 Biogon and can collapse a 50/3.5 Elmar without scratching the sensor. Then it would be the small camera I'm looking for. Hi, Does anyone have a solution to use the Leica 14-50mm (f2.8 that came with the L1) on to a Nikon body? Will it work? I have ordered a Nikon F to 4/3 lens adapter to try my Nikon lenses on the L10. I hope the quality is okay, it's ordered from eBay at John Camera Store for US$10 + shipping. "What would be a cool idea is if the camera maker introduced a 'manual focus helper' feature"
Well, actually at least Nikon and Canon do this already. The Canons beeb and flash the focus point in the viewfinder when sharp, Nikon has that electronic rangefinder-thingy on the D60, and the normal setup of two arrows and a ball in everything else. I believe everyone else something like this also. Maybe even Olympus? Focus confirmation doesn't work with contrast detect AF systems since the camera can't know how much contrast the subject is supposed to have when in focus. It has to let the focus change and pick the optimum. But when the human is controlling the focus ring, it's easy to see the catch. But the EVF is apparently sharp and big enough for people to focus by eye. And there is also magnified view two button presses away if needed. Re: tilt/shift: with the proper adapters one can use tilt/shift lenses from Nikon, Contax, etc. Re: collapsible lenses, it doesn't look to me like there will be enough room to collapse a lens even after accounting for the M adapter. The other thing about the G1 is that it is not intimidating. Try shooting candids with a D700 vs shooting with the diminutive G1. And the flip-out LCD helps with surreptitious shots. I've now tested the Nikkor 20/3.5AI and Pentax 17mm f/4 FE on the G1. I mounted them on FourThirds mount adapters and then onto the FourThirds to m43 adapter. They work very well indeed ... it's much easier to focus the Nikkor, even at f/11, on the G1 than it is on either the Panasonic L1 or Olympus E-1. For wide angle views, I will use an Olympus 11-22mm f/2.8-3.5 or the upcoming Panasonic 7-14mm f/4. And I already have the Leica 25mm f/1.4 in FourThirds mount. My interest in adapted lenses is to obtain compact, fast telephoto reach in prime lenses ... a Nokton 40/1.4 and Color Heliar 75/2.5 are what I want the most. I wish there were FourThirds or m43 lenses like these! But so be it. i'm a newbie to DSLR, so please excuse my question. I consider getting a G1, and still have some old M42 lenses from my parent's Praktica. did I get the comments in this post right: to use these lenses, you would need the micro-four-thirds to four-thirds adapter, and then the M42 to four-thirds, right?